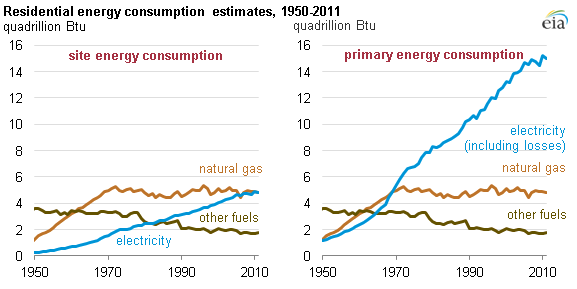 Source: U.S. Energy Information Administration, Annual Energy Review 2011, Table 2.1b. Electricity and natural gas now account for approximately equal amounts of the energy consumed on site in U.S. households. But because it takes on average nearly three units of energy from primary fuels such as coal, natural gas, and nuclear fuel to generate one unit of electricity, increased electricity use has a disproportionate impact on the amount of total primary energy required to support site-level energy use. Electricity-related losses explain the difference between energy consumption in the residential sector as measured by energy consumption on site (left) and energy consumption of primary fuels (right). Unlike natural gas consumption in the residential sector, which has remained nearly flat for decades, and consumption of other fuels, which has declined, the use of electricity in the residential sector has grown. Electricity powers dozens of machines in homes, including heating and cooling equipment, cooking appliances, refrigerators, dishwashers, and an ever-growing number of home entertainment and rechargeable devices. Although many electric end-uses are covered by federal efficiency standards or voluntary programs like ENERGY STAR®, increases in both the percentage of homes with those devices and, in the case of electronics like televisions and computers, the number of devices per household have offset efficiency gains in residential electricity use. For example, according to EIA's Residential Energy Consumption Survey (RECS) in 1993, only 22% of households had three or more televisions, and less than 45% used central air-conditioning. By 2009, nearly half of all homes contain three or more televisions, and more than 60% use central air-conditioning. Increasing electricity consumption within homes has broader implications for total energy use. In 1950, electricity generators used nearly five units of primary energy to generate one unit of electricity. By 2011, changes in the generation mix and improvements in technology lowered this value to 3.1 units of primary energy for every unit of electricity. Historical time-series data for commercial, industrial, and transportation are available in the Annual Energy Review, and projections are available in the Annual Energy Outlook.